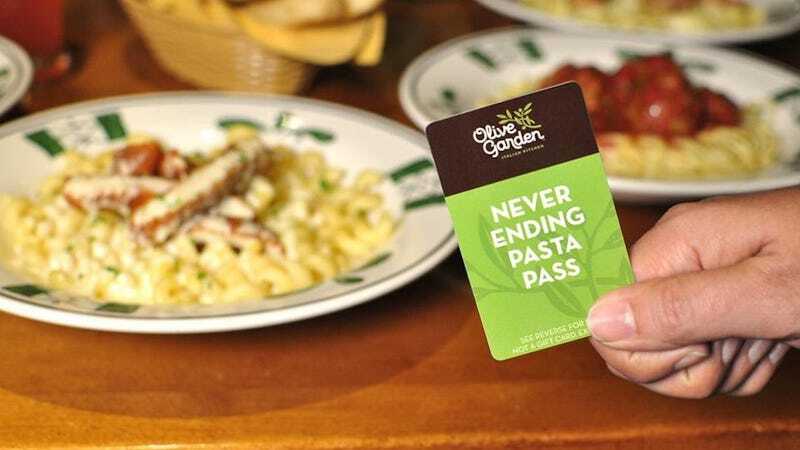 Given that they sold out in an hour and fifteen minutes, you very likely missed your shot at a $100 pass to gorge on Olive Garden until you upchuck alfredo in the parking lot. Fret not! You've got another shot, as long as you're willing to turn to the shadowy secondary market that immediately sprang up on Ebay. Grub Street points to this black-market bazaar, which popped up overnight. Passes are going for $150 to $300 a pop. Which is ridiculous. It would be a struggle to make the pass worth your while at $100; you'd practically have to move into your local Olive Garden, and your seven-week experiment may very well conclude in a case of scurvy. The only reason to pay more than the original list price would be for the feeling of rolling up to Olive Garden as a VIP. A whale. MISTER BIG-TIME BIG SPENDER.